Photon mapping has been a part of PRMan since version 11.0. However, the light sources had to have hard-coded distance fall-offs and the surface materials were restricted to a fixed, limited set of materials (matte, translucent, chrome, transparent, glass, and water). Perhaps the biggest limitation was that textures could not be used in the photon tracing phase. PRMan 13.5 introduced a much more general and flexible approach to photon mapping. The approach works with very general shaders, including area light sources, surface textures and displacement shaders. The main drawback is that it requires the direct illumination and the surface colors to be baked into point cloud files. The purpose of this application note is to provide examples for the use of photon maps for caustics and global illumination with very general light source and surface shaders. In order to control the emission and and tracing of photons, we first need to bake the the illumination and surface colors. 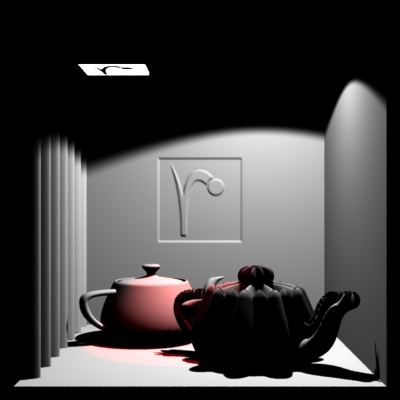 Photon emission corresponding to simple light sources (point lights, spot lights, and directional lights - even with "barn doors", cucoloris, and projected textures) is fairly straightforward. However, general light source shaders can also have unnatural distance fall-off, fake shadow positions, fake position of the highlights, etc. It is difficult to make the photon emission match such shaders. However, here we will use a different approach: evaluate the light source shaders at the surface points by rendering the direct illumination from the light sources. This basically treats each light source shader as a "black box" that is fully characterized by its illumination on the surfaces in the scene. 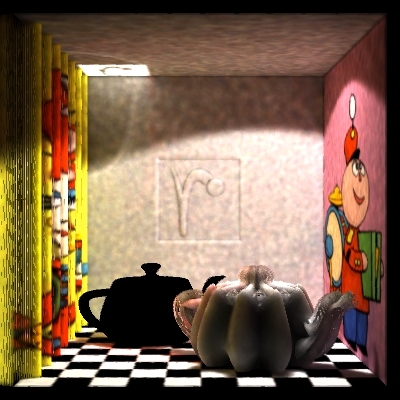 As an example, we'll use a box with two teapots and texture and displacement maps. The scene is illuminated by three light sources. They store illumination for use in photon emission - three light sources bake into the same point cloud file. Below are the two light source shaders used. The shader 'myspotlight' is a spot light with no distance fall-off by default; 'projectorlightxz' projects a light texture (in the x-z plane) similar to a slide projector. 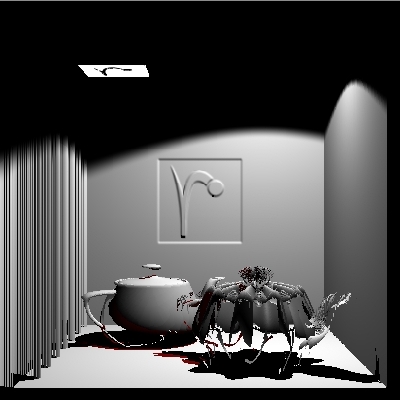 The shadows are computed with ray tracing. The line "L = L;" is a necessary trick to avoid an unwanted optimization, thus ensuring that the light source shader is being run on all shading grids. L = L; // trick to avoid skipping light source shader call !! For completeness, the three displacement shaders are listed in Appendix A. The use of displacement shaders here demonstrates that displacement works fine with photon mapping. Attribute "displacementbound" "sphere" 0.1 "coordinatesystem" "world"
Attribute "displacementbound" "sphere" 0.01 "coordinatesystem" "world"
Displacement "dispmap" "string texturename" "prman_logo.tex"
The red illumination is less visible in the image to the right since ptviewer happens to display the gray illumination points on top of the red illumination points. Also note that no points are baked in areas with no illumination. Special case: If all surfaces are purely diffuse, the L direction does not need to be baked. In that case, it is sufficient to bake the total Cl (the sum of illumination from all light sources) along with the micropolygon area; this can can be done in either the surface shader or in an atmosphere shader. Potential pit-fall: if multiple light sources write to the same point cloud file (as in the example above) then it is important that the DisplayChannels do not turn on "EliminateDuplicateGrids". If they do, then only points from the first light source will be stored in the point cloud. If EliminateDuplicateGrids has to be on (for netrendering) then baking should be done in a surface shader (or atmosphere shader). To specify the scattering coefficients, the scene must be rendered with surface shaders that bake the scattering coefficients for the surface materials of the objects. 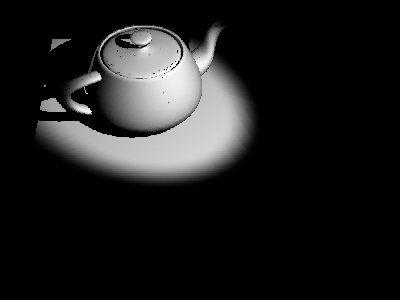 In this example, we only baked diffuse and specular reflection coefficients. It is also possible to bake diffuse and specular refraction coefficients as well as the index of refraction (ior). 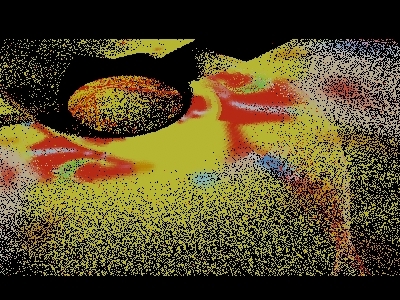 In this example, all scattering coefficients were baked to a single point cloud file. It is also possible to bake several point clouds, for example one per object in the scene. The next step is photon emission and tracing. The photon emission and tracing is guided by the point clouds baked in section 2. 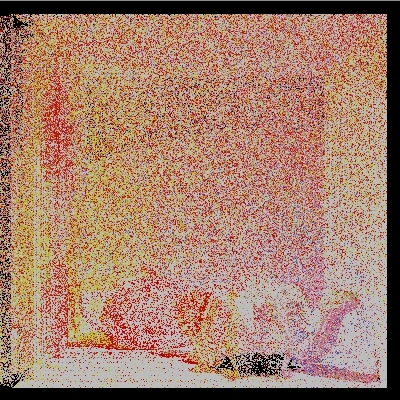 Hider "photon" "emit" 100000 "emissionpointcloud" "box_direct.ptc"
If no emissionpointcloud is specified, PRMan will revert to the old behavior: it will emit photons corresponding (as much as possible) to the light sources in the scene. Attribute "photon" "shadingmodel" ["matte" | "translucent" | "chrome"
| "transparent" | "glass" | "water" | "refractive:ior=..." | "dielectric"
In the following RIB file, the illumination point cloud "box_direct.ptc" is used to guide the photon emission and the scattering coefficients in "box_scattercoeffs.ptc" are used for photon tracing. Hider "photon" "emit" 1000000 "emissionpointcloud" "box_direct.ptc"
This step ensures that there are no gaps in the radiosity map. This step is only necessary if point-based color bleeding is used for final gathering in the following rendering step, and if the photon map has gaps between photons in areas with little illumination. In our box example, the front of the displacement-mapped diffuse teapot is such an area, as are the floor regions under the teapots. "string infile" "box_rad.ptc" "string outfile" "box_rad2.ptc"
Create a brick map from the radiosity map point cloud and use ray-traced final gathering. 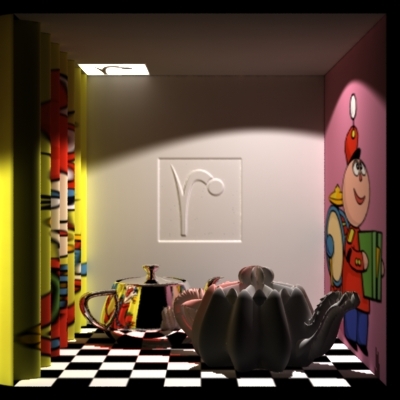 This approach is described in the Global Illumination application note. Point-based color bleeding. 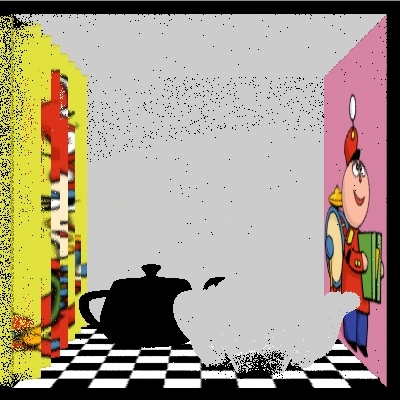 This is similar to the color bleeding approach described in Section 3.2 of the Point-based Approximate Ambient Occlusion and Color Bleeding application note. The only difference is that the point cloud in this case represents global illumination, not direct illumination. Notice that to get the best quality point-based color bleeding, the indirectdiffuse() parameters "clamp" and "sortbleeding" are on, and "colorhitsides" is "front". Here is the final image with global illumination. Notice that all illumination on the ceiling (except for the bright "bouncing r" square) is indirect. If the lines starting with "causticfile" are un-commented, the computed image will also contain caustics caused by specular reflection of light in the chrome teapot. The box example shown in the previous sections has caustics from the specular teapot. However, the caustics are not very distinctive. 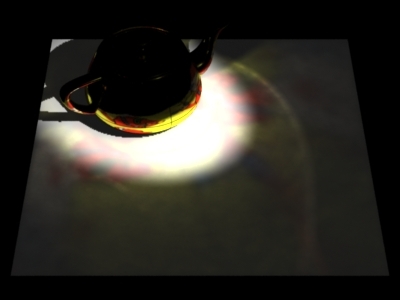 Here is a simpler example with clearer caustics. 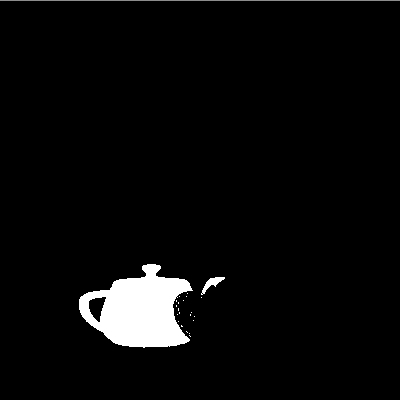 The scene consists of a textured, specular teapot on a diffuse plane. The result is a caustic photon map file (called teapotcaustic_cpm.ptc) with around 196,000 photons. Displaying the caustic photon map with ptviewer -multiply 2000000 teapotcaustic_cpm.ptc gives the figure below. 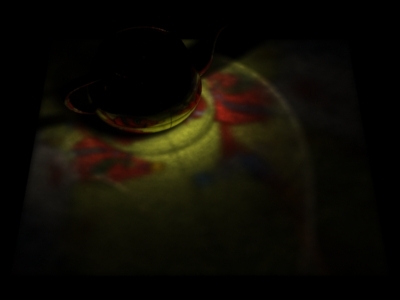 The colored caustics caused by the texture on the teapot are clearly visible. In this example neither the caustic casting object nor the caustic receivers are displacement mapped, but they could easily have been. PRMan can currently only handle one point cloud (or one brick map) for scattering coefficients. It would be nice to have the possibility of having more point clouds and brick maps, for example one per object. No glossy reflection or refraction (neither isotropic nor anisotropic) in the photon scattering phase. 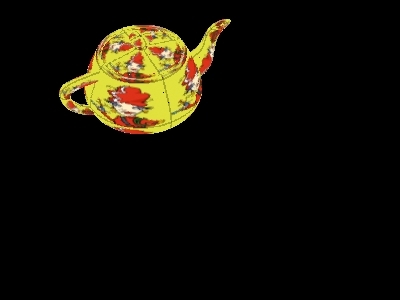 The shader 'dispmap' uses a texture map for displacement, 'dispsinz' computes a wavy displacement depending on the z position (depth), and 'disppumpkin' computes a displacement that makes a teapot look like a pumpkin.